The East Coast's attractions really are some of the best in the world. 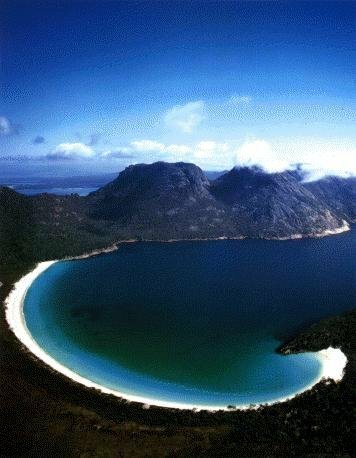 The highlight is definitely the Freycinet National Park/Coles Bay area. The surrounding photos are all taken in this area, and you can judge for yourself. Spectacular Wineglass Bay beach (left) has been voted by one of the USA's top travel magazines as one of the top ten beaches in the world. The Queen of England has barbequed on the beach, with the Royal yacht Brittania mooring offshore. Great walks abound, including the one to the top of Mt Amos (below). 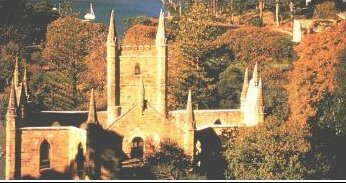 Coles Bay is a delightful little town with amazing views of the Hazards, the imposing mountains. 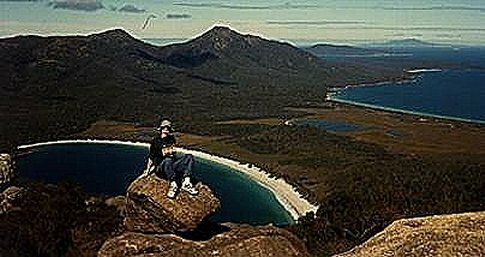 North of Freycinet is the Douglas Apsley National Park. The best feature about this park is its lovely swimming holes in immense rock gorges, ideal for a summer's day's walk. 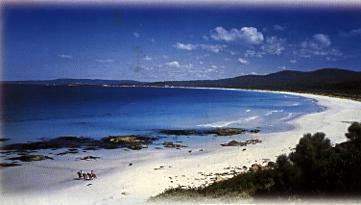 Binalong Bay is a lovely quiet holiday town 10km from St Helens. Swimming and fishing are the order of the day here. Fishing in lagoons and in the sea is great all down the coast. Tasmania's wettest place is Gray, up on the Elephant Pass near St Marys. Also here is the Mt Elephant Pancake Barn, a must see. (and eat) Fariy Penguins can be viewed north of Bicheno. Clockwise from top left: A spectacular view of Wineglass Bay; View of Wineglass and the Isthumus from Mt Amos; Salamanca Place, Hobart; The Hazards at sunset from Coles Bay; the white sands of the East Coast. 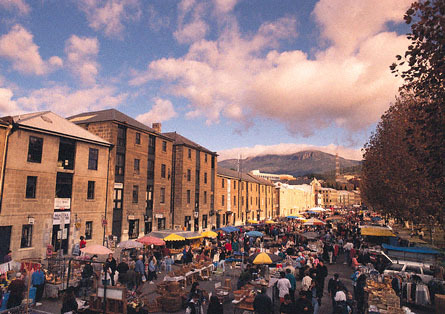 Further South of course, you will arrive at Tasmania's capital, Hobart, a vibrant, seafaring and historic city with so much to see and do. 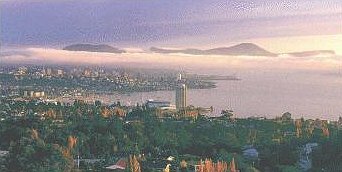 Attractions include the Salamanca Markets, Derwent River Cruises, the Cascade Brewery, Australia's first casino at Wrest Point, the Dreamworld Antarctic Adventure, Mt Wellington, the Shot Tower and the infamos Cadbury's Chocolate Factory.